Designed by Emile Dewoitine to compete in the French C1 single -seat fighter competition of 1921, the prototype D 1 flew for the first time on November 18 1922. A high-wing monoplane with fabric-covered metal wings and an oval-section metal fuselage covered by duralumin sheet. Armament was two 7.7mm synchronised Vickers guns and power was provided by a 300hp Hispano-Suiza 8Fb (HS 42) eight-cylinder water-cooled engine. The principal criticism being the poor forward visibility. A 120mm pylon was therefore inserted between wing and fuselage, the fighter, now referred to as the D.1bis, becoming a parasol monoplane. This modification was completed in August 1923, by which time the first three (of 10) pre-series aircraft had been supplied for official evaluation in the initial configuration. Two of these were lost in accidents and the third was modified to D.1bis parasol form. After prolonged evaluation of all the 1921 contenders, the Dewoitine D 1 and Spad 80 each received a contract in 1924 for 80 aircraft, the two types being intended to replace Spad XIIIs and XXs in Aviation Militaire squadrons. A further 29 D 1 s were ordered subsequently f or the Aeronavale. 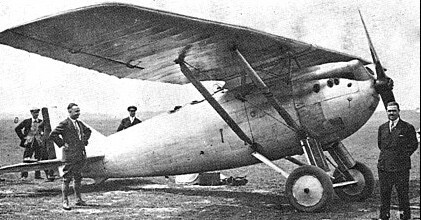 Dewoitine's chief test pilot, Marcel Doret, set speed records (with and without payload) of 233.10 km/h (144.84 mph) on December 23, 1924, and the D 1 could climb to 5000 m (16404 ft) in 15.1 minutes. The next five pre-series. aircraft (the fourth, fifth and sixth having been ordered by Czechoslovakia, Japan and Italy respectively, and the seventh and eighth by Switzerland) were all completed to D 1bis standard, but continuing criticism of forward view led to replacement of the shallow pylon between wing and fuselage by a cabane of inverted-vee struts on the prototype which thus became the D 1ter. The two pre-series aircraft for Switzerland were modified to this standard prior to delivery, the two lost during official trials) were completed as D 1ter fighters, the cabane struts being standardised for production D 1s. A contract had been placed in November 1923 on behalf of the Aeronautique Navale for 44 D 1s, with the government providing guarantees for 150 aircraft. The production contract was placed with the SECM (Societe d'Emboutissage et de Constructions Mecaniques) which flew its first series D 1 on 18 January 1925. 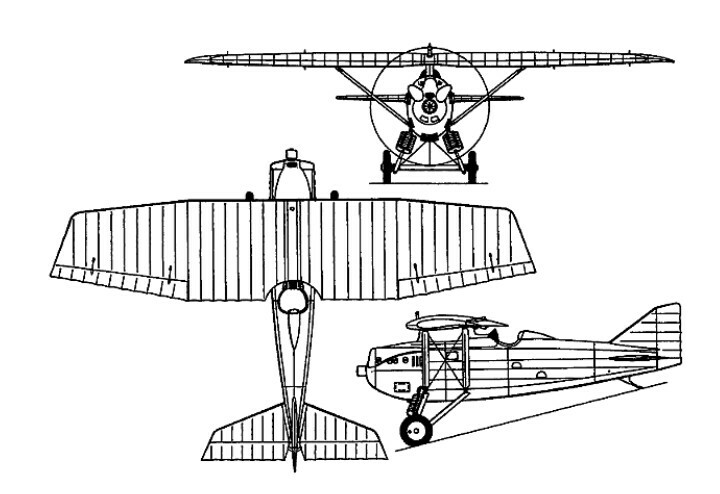 The production aircraft required several successive structural reinforcements, and did not gain acceptance by the Aviation Militaire until 1929. The D 1 was of mixed construc-tion, with an open cockpit and two 7.5-mm (0.295-in) machine-guns in the engine upper decking. The final version, the D 1 ter, had a more conventional strut-type centre section cabane. Most Aviation Militaire D ls were soon transferred to the Aeronavale units, including 3C2, 4C1, 7C1 and 7C3; by mid-1931 these units had re-equipped with the Nieuport-Delage 62. The Aeronautique Navale took delivery of its D 1s from early 1925, and in the previous year an order for 20 had been placed on behalf of the Forces Aeriennes Terrestres, although these were never to equip a service unit. Dewoitine D ls were exported to Japan (one), Switzerland (two) and Yugo-slavia (79), and a further 126 were built (with modifications) by Ansaldo at Turin for the Regia Aeronautica, with the designation AC 2.